I may be in big trouble for admitting this, but I rarely read the Pioneer Woman’s website because it makes me feel a) overwhelmed and b) little? Like my blog is little. But her blog is simply beautiful and she is a talented writer. I love her. I do! 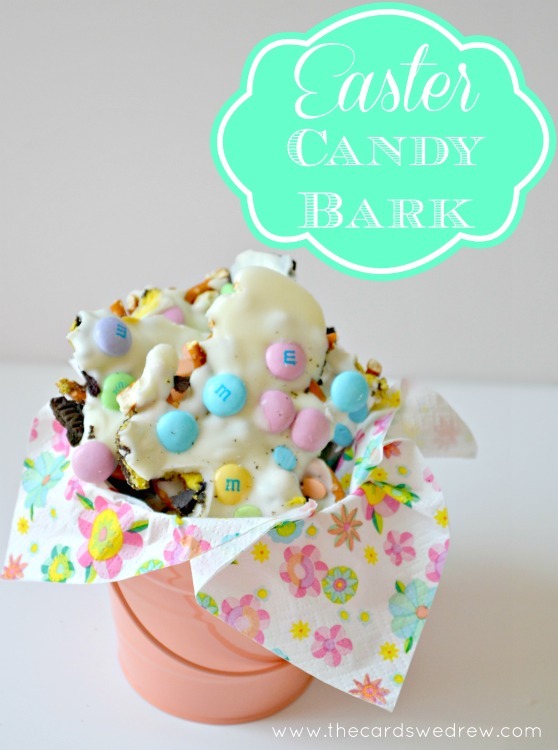 When thinking of Easter dessert ideas, I went straight to PW’s site, and of course was led to another site, Gingerbread Bagels, that has this make your mouth water easter candy bark recipe. Here’s how you make it, per Gingerbread Bagel’s original recipe. Measure out the candy and cookies. Set aside. Put 8 ounces of semi sweet chocolate chips and 8 ounces of milk chocolate chips in a microwavable bowl. Melt the chocolate chips but be careful not to overheat the chocolate. In a microwavable bowl, melt the pink candy melts. (you can use whatever color you like). 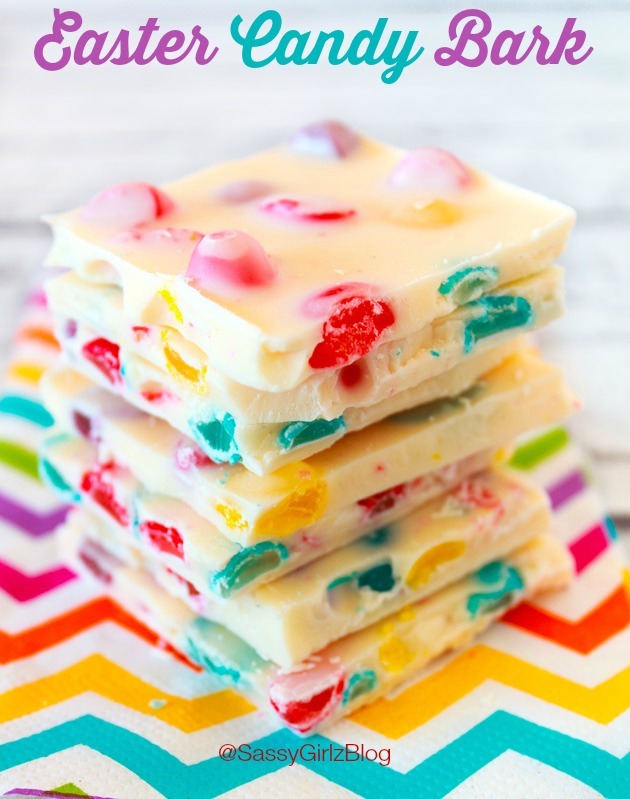 Be careful not to overheat the candy melts. Drop the melted candy melts on top of the chocolate. Using a knife, swirl it up and down. Then swirl it back and forth. Place the candy and cookies on the melted chocolate/candy melts. Press down lightly. 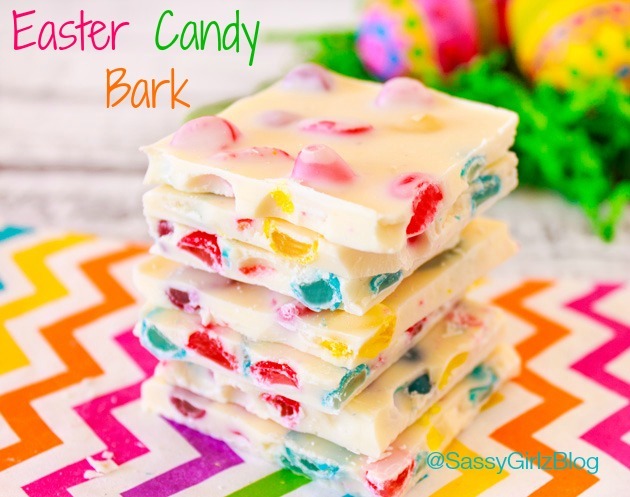 Allow the Easter Candy Bark to dry for at least 3 hours. Cut into pieces and enjoy! Now that I understand the basics of “bark” I just might be hooked on making it all the time. Please note I refrigerated mine overnight, as it wasn’t hardening up enough on the counter. Also, I used a baking sheet because I was out of parchment. It broke/popped out just fine. And because no holiday is complete without cupcakes, W & I whipped up some cupcakes. He “helped” decorate by putting his finger into the frosting (and licking it) each one. Guess we can’t share now.